He was invited to Norway by Films from the South festival. At the same time a collection of his poetry was published in Norwegian translation, and his photos exhibited at this museum where I talk with him. I ask him if he has any fears when he’s making films. Is he ever scared of something? “The collective is what is dangerous. It is good to be in a group with people, but at the same time it is dangerous. It is not good if a group has the same idea, the same way of thinking,” the director answers. Alienation. This film philosophy and work method is connected to his original education as a painter, according to Kiarostami. Because that is where he started off, before a job with a producer of commercials in the 1960s led him into cinema. His first short films from the 1970s is small, interesting stories, mainly with children as leading characters. His playful and simple style, already evident in these first films, was going to color his whole filmography. For instance in his most famous film, Taste of Cherry, which in 1997 was awarded the Palme d’Or in Cannes (and was given the Criterion treatment two years later). You mix both fiction and documentary filmmaking techniques, and you work a lot with amateurs in front of the camera. Are you capturing reality better like that? Kiarostami himself is more concerned with reminding the audience that they are watching a film, than making them think that what is unspooling on the screen is real. Fire. In the Iranian film Portrait of a Lady Far Far Away (2005), directed by Ali Mosaffa, there is a scene that burned itself onto my retina, and stayed there months after seeing the film. In the scene, we’re at a secret art show in a backyard in Tehran. During a performance, someone sets fire to a large photo. While the picture is burning to ashes, the artist proclaims that what was pictured, had now been set free. The connection between images and flames has a painful and complex back story in Iran. When the Islamic revolution was set in motion at the end of the 1970s, fires in cinemas was given a symbolic meaning. It started when Rex Cinema in Abadan was set on fire on August 20th 1978, and approximately 430 people died. During the next year 180 cinemas in Iran was burned to the ground. Censorship. The cinema fires, though, have had a paradoxical consequence: In fact, it was only after the fires that the nation’s own film scene began to flourish. The shah who had governed the country before the revolution, had let foreign (mostly western) films dominate the cinemas. But after the revolution, it was only legal to screen Iranian films. It resulted in enormous tasks, and huge growth, for the Iranian film community. But at the same time, they’ve obviously had very strict censorship laws to struggle with. The so-called “Red line” – a constantly fluctuating border created by the authorities that controls what an artwork is allowed to express – has given Iranian cinema a unique aesthetics; they are often inferring, discreet films rich with allegory. 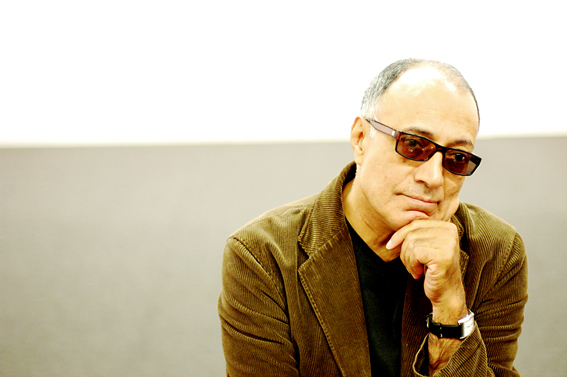 In the middle of all this is Abbas Kiarostami, who has been one of the foremost representatives of Iranian cinema. But sadly, his films have been prohibited in his homeland since 1997, when Taste of Cherry – which was about suicide – put him on the black list of the authorities. My thoughts return to the burning photo from Ali Mosaffa’s film – and the figure that was captured within it – and I ask Kiarostami if he feels powerful when he’s making film. He’s suddenly silent for a long while. “Lets watch the last five minutes of it together,” says Kiarostami. We enter the video projection room, which during our interview has let out a surreal, hypnotic soundscape in the background. The film that Kiarostami wanted to show me, is a looped video montage of the photographs that is being exhibited in the museum. We’re watching it, and waiting. The final image is staying on screen longer than the others. Suddenly, it catches fire in the bottom right corner and burns completely to ashes in front of our eyes – inside his film. I’m glad I came across this. Lovely read. His work and views are stunningly simple. I hope to be as passionate about what I choose to do as he is about film making. And I will be dropping in here often now.